The first time my wife and I visited the Emerald Isle, the border between Northern Ireland and the Republic was lamentably clear: Ominous-looking checkpoints appeared at strategic junctions of major thoroughfares, where conspicuously armed British troops checked IDs and sometimes vehicles. Today, crossing between the Republic of Ireland and “the North” – a politically neutral euphemism – is so seamless that the Golf Road Warriors were occasionally confused by exactly where one ended and the other began. There are a couple of superficial ways to tell the difference. 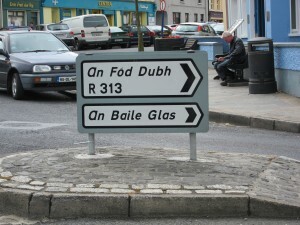 First, as an avowed bastion of Gaelic preservationism, almost all road signs in the Republic are in the native tongue. Most are accompanied by the English translation, but the farther you travel from urban centers, the more prevalent is the preference for Gaelic usage. Gaeltacht refers to regions where the Irish language is spoken, and the most vibrant of these are in the northwest. Belmullet, for example, where we played Carne Golf Links, is noteworthy for the profusion of Gaelic on signage and usage among the locals. Second, there’s the currency. The Republic uses the euro, while Northern Ireland still employs British pounds sterling. It can be an inconvenience, but even here efforts at conciliation are evident: Analogous to using U.S. dollars in Canada, you can pay for something in euros in Northern Ireland, but your change will be in pounds. In the days when the Republic’s financial system was based on the Irish pound, many merchants simply declined to accept the other country’s currency. Thankfully, like the former checkpoint protocols, those days are gone.